In a city where the boundaries between life and death are laid bare, artists are birthing new spaces for dreaming ‘other ways of breathing’. Stacy Hardy reports from Kinshasa. Art is the strength to make reality say what it would not have been able to say by itself or, at least, what it might too easily have left unsaid,” wrote the Congolese novelist and playwright Sony Labou Tansi in 1985. 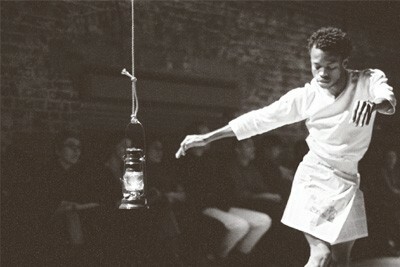 Dancer and choreographer Faustin Linyekula is precisely such a poet. His realm is the stage, his medium is the body, but his work is defined by a similar quest for truth – a truth arrived at not by defending reality or by embracing illusion, but rather, like Tansi, by seeking out a physical language that breaks the assumptions of both reality and illusion; a truth that can birth new spaces for dreaming “other ways of breathing”. It is this desire for a new sense of truth that provokes Linyekula to return to the Congo after years in exile dancing his way to fame in the capitals of Africa and Europe. There he creat es what has become known as Studios Kabako, a network of emerging artists spanning the world; a home for dreamers that encourages “a fluid movement between the social and the artistic”. The company has its roots in Kinshasa, the capital of the Democratic Republic of Congo. Once “Kin la belle” of Linyekula’s childhood, now “Kin la poubelle”, a city in ruin, haunted by the ghost of Mobutu Sese Seko and shaped by intense strife between the energy of its survival economy and the horror of life. 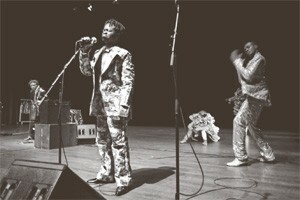 He looks to Kinshasa’s music culture, the songs, dances and fashion that have so long been the lifeblood of the city. Antoine Moundanda’s kisansi-rumba of the 1950s; the independence cha cha cha of the 1960s; and François Luambo Makiadi, a.k.a Franco, the voice of Mobutu… but also the voice of the people. Out of this seeming emptiness Linyekula creates Kabakos Studio’s first performance, Spectacularly Empty II (2003). An empty stage, bare bodies set against the superficial abyss of a screen, a hypnotic transparency which simulates and denies space at the same time. The contrast between illusion (which is spectacular) and reality (which is empty), but also the spectacular emptiness of the naked body set against the emptiness of the spectacle. Alone on stage. Franco’s music drives Linyekula as he punches into a boxing bag. A gruelling marathon. 12 rounds. “Almighty OK Jazz. We entered OK, we came out KO.” He is Franco. He is Muhammad Ali taking down George Foreman at Stade Tata Raphaël in Kinshasa in 1974. Abundantly layered in an intensely personal language of the self, The Dialogue Series: i. Franco culminates in an affirmation of the body as one’s “only true country”. It shows that what is most meaningful in living can be uncovered in the scattered traces of our individual and personal experiences. 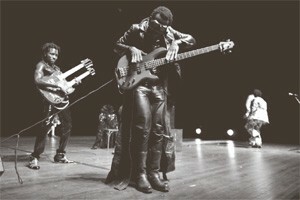 During 2006 Linyekula moves Studio Kabako from Kinshasa to Kisangani, the city of his birth. Capital of Orientale Province, Kisa is a city at the heart of the war, ripped open by violence and mineral extraction. But if Kin’s ruins are haunted by Mobutu, it is Patrice Lumumba that haunts Kisa. “This here is my city,” the leader of Congolese independence said in 1961. A city then, also of hope, Kisangani redefines Studios Kabako – a dance and theatre ensemble, a communal place for exchange. The answer came as last year’s Dinozord: The Dialogue Series iii, Studios Kabako’s first piece created in Kisangani. A deeply personal narrative that employs what Tansi calls “passwords of flesh,” creative strategies that can “send the body back to hope” and “provoke meat to leap”. “More future” became more more more…future, the title of Studios Kabako’s new work, currently in production. Its title suggests the trajectory. More more more…future is a work based on excess and scattering, an aesthetic of sensuous surplus, overload and over-elaboration. Yet, it is not spectacle – for there can be no spectators. Everyone present is implicated. Performance itself is implicated. Its inspiration is ndombolo dance culture. Its subject is the show trials and public executions that have replaced theatre in the Congo. It lays bare the messy collusion between ruler and ruled, the grotesque moments of duplicity and complicity that have come to define life. “The most important thing is not the aesthetic object. Art is not important. The most important thing is to believe in something in a context where it’s impossible to believe in anything. The work is thus an act of faith. “So the form emerges. It’s music but it’s music that only makes sense when it has a physical impact. So we will turn up the volume. It has to be loud so we’ll stop hearing all the noise – NGOs, politicians, propaganda, statistics. So I can hear the sound of my body and then the sound will get the bodies to move. Muhindo’s reply came as a “dog’s soliloquy” – words, not as symbols, but as pieces of living tissue. Not spoken, not enunciated but flung. Lamine’s costumes: not clothes but literally skin, prosthetics that transform or extend bodies. The movement is not even dance. It predates the choreography of dancing – it is the body manifesting itself and manifesting us – feet communicating to a pitch of fury that is life, is love, is death. The music, which anchors the project, is directed by acclaimed guitarist Flamme Kapaya, a graduate of the ndombolo factories of Wenge Musica Maison Mère and Werasson. But here ndombolo’s ecstatic energy and physical power is turned against commercial ideologies of containment and control. The music infects bodies, pervades and infiltrates them, and in a turbulent explosion of noise ungrounds death – life feasting on death or a life-infested death, an unthinkable intensity of life. More more more… future is not an easily locatable cultural mimicry, but a rogue arsenal of displacements and delirious incantations. The violent, vulgar aesthetics of power that characterises commandment is invisibly turned against itself. A different form of power emerges within this very moment, generated by the body in movement. The body becomes a rogue space once more. It traffics in the unspoken. It steals and scavenges, displaces and reinstitutes the world with which it plays. This story was originally published in Chimurenga 16: The Chimurenga Chronic, available here in print or PDF.